(Nanowerk News) Graphene has been called the miracle material but the single-atomic layer material is still seeking its place in the materials world. Now a method to make 'defective' graphene could provide the answer. 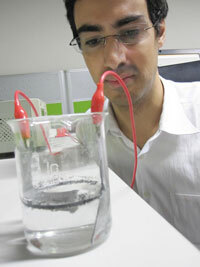 Mario Hofmann is holding an example set up of the electrochemical synthesis. Today (30 July), in the journal Nanotechnology ("Controlling the properties of graphene produced by electrochemical exfoliation"), a team of researchers report that they have developed a simple electrochemical approach which allows defects to intentionally be created in the graphene, altering its electrical and mechanical properties and making the material even more useful. The researchers used a technique called electrochemical synthesis to break graphite flakes into graphene layers. By varying the voltage they could change the resulting graphene's thickness, flake area, and number of defects - all of which alter the properties of graphene. "Graphene is basically a metal - so it's somewhat boring!" explains Mario Hofmann, a researcher at National Cheng Kung University in Taiwan. "But when you start adding defects you begin to get interesting effects." First studies on the electronic properties of graphene that brought received a lot of attention and the Physics Nobel prize in 2010 used graphene that was produced using adhesive tape to remove flakes of graphene from graphite. However, its defective counterpart graphene oxide could be first to carve out a significant market share as polymer fillers and battery electrodes. More precise control over the amount and nature of defects could bring about new applications of graphene in drug delivery or electronics. "Whilst electrochemistry has been around for a long time it is a powerful tool for nanotechnology because it's so finely tuneable." continues Hofmann. "In graphene production we can really take advantage of this control to produce defects." Carefully controlling the voltage has allowed the team a previously unknown level of control of the amount of these defects. The team developed a system of pulsed instead of continuous voltages, allowing them to unravel the exfoliation mechanism. To monitor the evolution of the graphene in the solvent they found that simply tracking the solution's transparency could give them quantitative information on the efficiency and onset of exfoliation. They next plan to study the effects of adjusting the pulse durations throughout the exfoliation process to improve the amount of exfoliated graphene and introduce more complex pulse shapes to selectively produce certain types of graphene defects.